I am notoriously impatient. I struggle with it. One of the things I really really hate is waiting for something I need to come in the mail. So if I need a tool and I know I will have to order it and it will take a day or more to get to me I am more likely to spend hours trying to make something that will work rather than setting something aside till whatever it is arrives. I have been working on a layout that I finally realized really needed distressing on the edges of some of the papers. It was more distressing than I was prepared to do with a nail file. I have been meaning to get a distressing tool but (surprise, surprise) never got around to it, so while doing the dishes this AM I was contemplating how I might make something that would work. Then I made one. I punched a couple of cereal box weight card (maybe slightly thicker) and took the lid off one of my American Crafts shapes tubes. 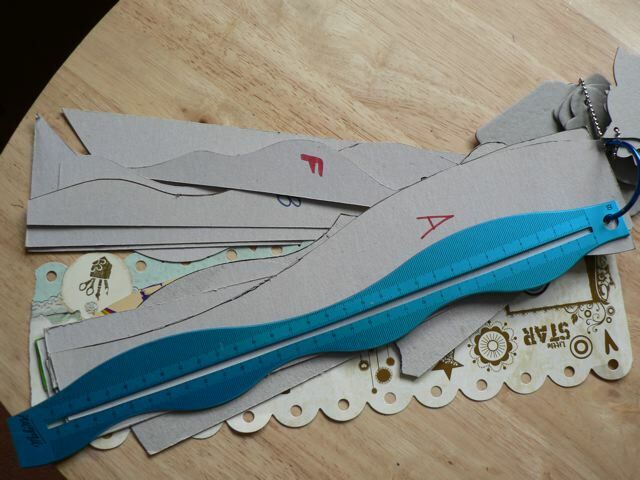 I drew around it, so I could see where my cuts needed to extend past, then cut notches in the cardboard. I lined the rim of the lid with redline tape and cut a strip of coarse sandpaper to fit. Stuck it on. One side of the lid was hollow so I filled it with some scraps of sticky-backed foam, leftover from my iPad cover making. 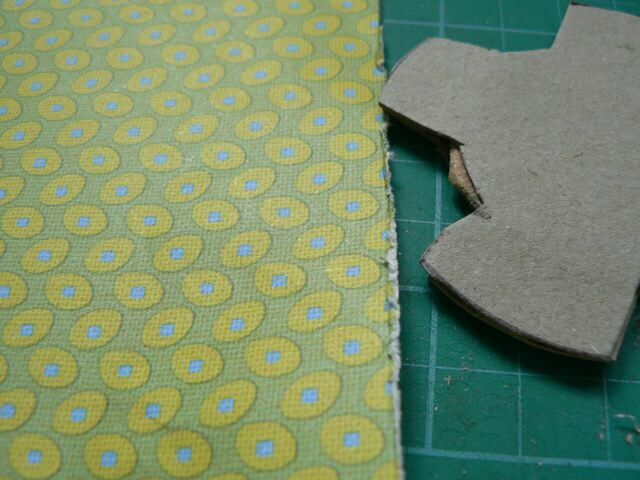 Covered both sides with a patterned paper circle then stuck on the notched scallops. I only decorated one side, as there is a fatal design flaw, which I expected but as I was using what I had on hand and viewed it as only a temporary thing (till I order a real distress tool) it didn’t bother me a lot. But I did want to know which side was the “top” because of it. I think I took this before I stuck it down, so while it may appear the gaping is the flaw, it isn’t. The flaw is the little rolled edge of the lid. 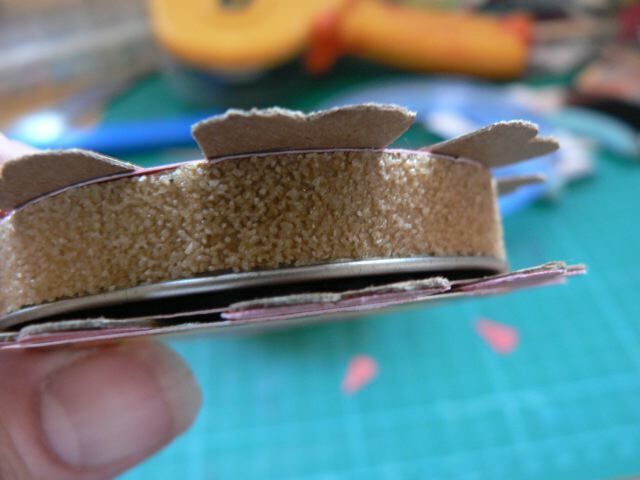 If you draw the sandpaper along the paper or card with the rolled edge at the BOTTOM it doesn’t work as well – although that depends on if you are drawing the tool towards you or holding it and drawing the card/paper towards you, or scrubbing it back and forth. It will get me thru the day and let me distress my layout bits more easily, and really took only about 10 – 15 minutes to actually make (way less if I wouldn’t have bothered to decorate it, but I figured I needed something to remind me that the how to hold it (thumb on the circle) so why not make it look pretty?) but at the end of the day how worth it was it? Not sure yet. I’ll see how it goes. As you can see, that one worked too, although the one I made today fits a bit more comfortably when distressing a lot of edges. 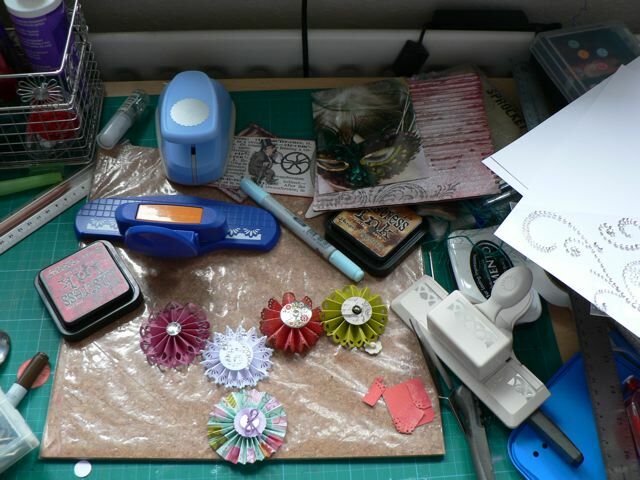 Categories: scrap related, tips & finds | Tags: how-to | Permalink. Some are curves I “made” using one of the flexible rules (not every one, but if I made one and really liked it, I made a template of it), some are things like the bracket shape (just one side – I rotate to create a full page bracket) traced from a piece of retail paper, oe bits of packaging, or labels. 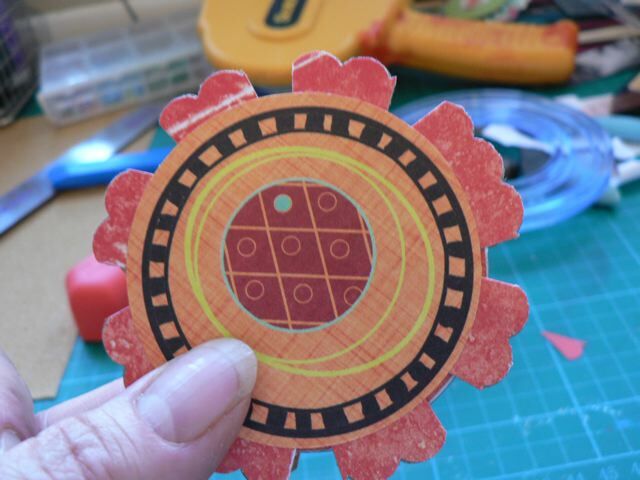 Whenever I find a shape that I know I will use again and again, I make my template from cereal box card, punch a hole and thread it on my book ring. It hangs on my wall and not a week goes by that I don’t drag it down to make a shape. 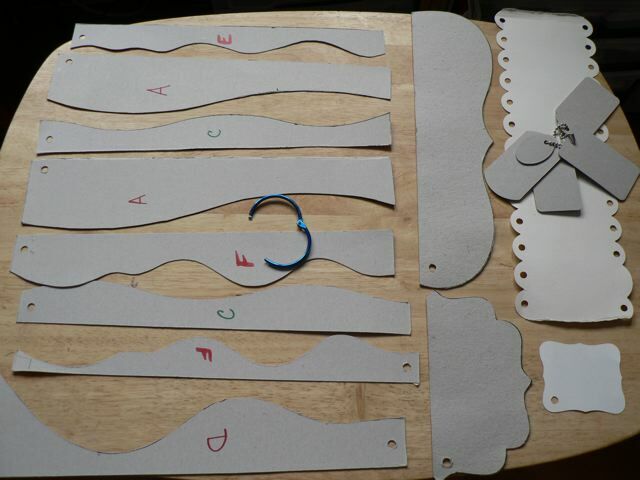 Sure, I drag out my Cricut, or fire up my Craft Robo for many shapes, but if I go to a crop or if I just want to cut one thing, this is far easier – especially as I can pick and choose exactly where I want the pattern of the paper to appear. They work, too, as edge masks for things like Cosmic shimmer. Scrapbooking stuff costs so much, I love being able to make use of something free (or certainly free-ish) and to be able to make my own bits from any paper I like. 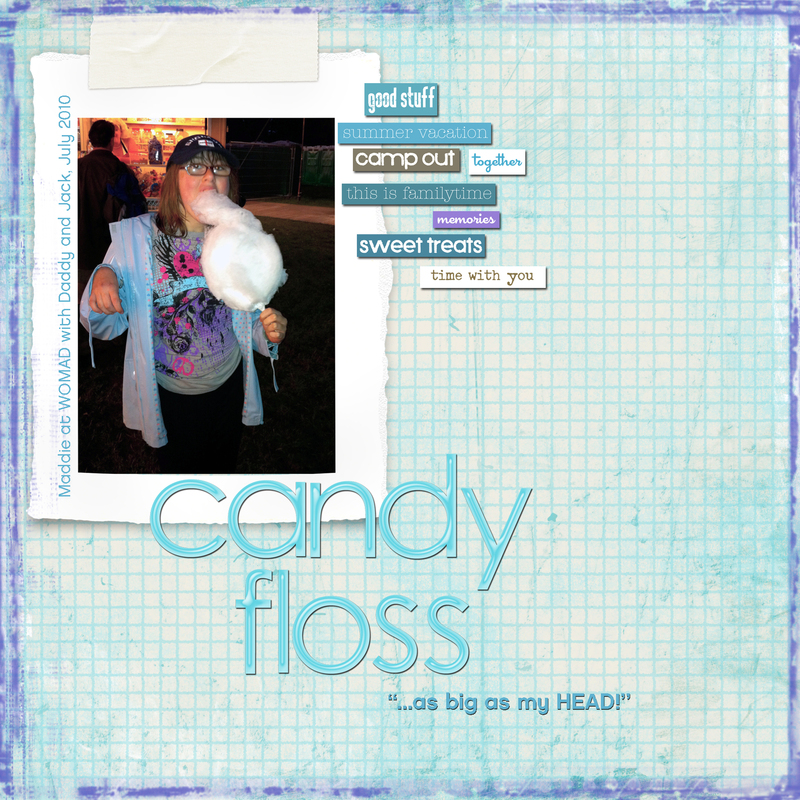 Categories: scrap related, tips & finds | Tags: scrapbooking | Permalink. Well it’s taken me a while to realize my idea for the current SDC challenge. I had the idea right off, but both figuring out how to make it and finding the time to make it proved difficult. But finally, here it is. What I love about these challenges is that I do really try to challenge myself, in the true sense of the word, by making something that is often a bit OTT, something that, were it not for the challenge I might not bother. It was fun once, but not sure I would rush to make another too quickly. 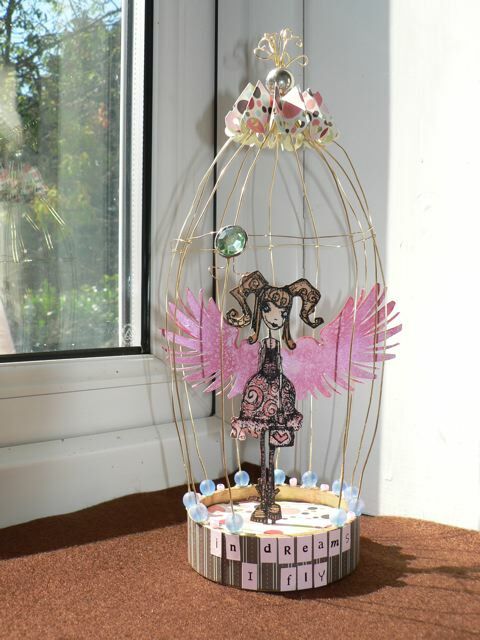 Categories: Challenges, paper sculptures, stamping | Tags: Stampotique, stamps | Permalink. I did do the video for these the other day, then waited for it to fully load on You Tube and had a few issues. It took most of a day for the playback to work absolutely properly so now I feel I can post it and hopefully it will work. 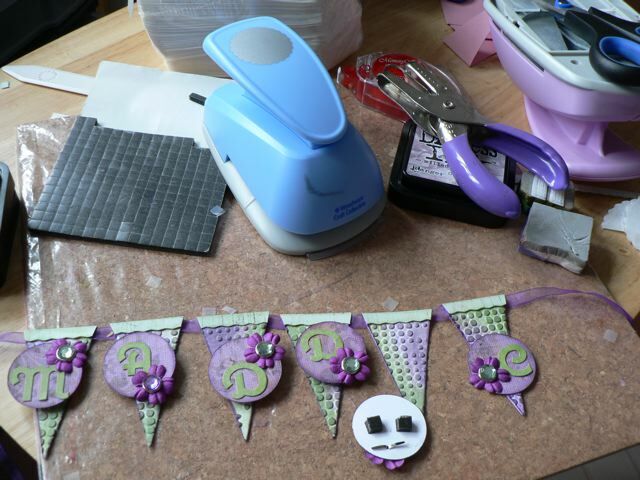 One thing – the cardstock ones will want to spring open with just glue dots. I would strongly suggest firing up the trusty glue gun and putting a dab in the center then squeezing it shut and adding the embellishment to hide it. If you do that, just stitch the button to the topper (circle or scalloped circle) and stick it on rather than struggling to get a needle thru the middle which is full of dried glue-gun glue! People comment a lot on my vids, asking about the music. USUALLY it’s just an appropriate length MusicShake instrumental added via the You Tube AudioSwap process (which takes FOREVER, when it’s working) but this one is actually my FIL singing with his previous band. I just love his voice and it’s a shame both my kids got their vocal talent from my side (tone deaf, all of them) and not from him. I love my kids, but hearing my DD sing along to Girls Aloud, if bottled, could work well as a paint stripper, and when I sing along to the radio or iPod, my kids just roll their eyes and say “Mom – please. Stop” DS is a bit better, but he will never belt out a tune, so it all sounds a bit hesitant. Anyway, I hope you enjoy it, even if old-timey bluegrass isn’t your thing. I did set the music to play at 1/2 volume when I did the video but I’m not sure if YT doesn’t set volume to a certain level, and that overrides the video settings. And I’ll include a few close ups of the rosettes once my camera battery recharges. 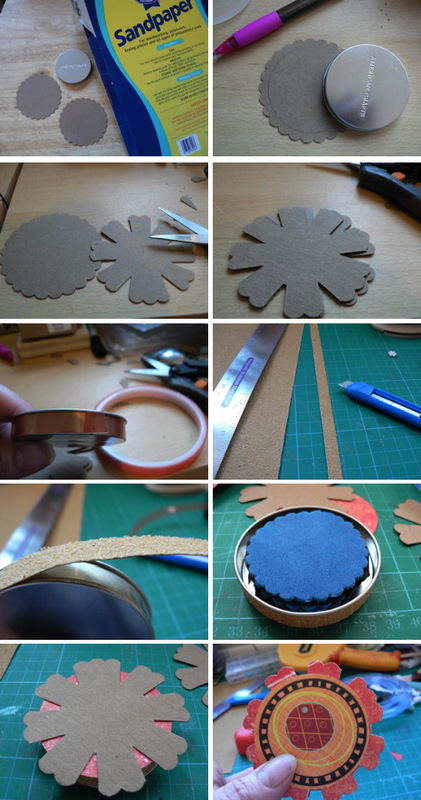 Categories: paper sculptures, scrap related, tutorial, videos | Tags: flowers, videos, YouTube | Permalink. Quite a busy day as we are taking DD to meet up with her charity group and see her off for her weekend in Cornwall. And getting DH and DS ready for Cropredy. BUT, I have still have a lot on my desk! Not sure how many WOYWWers read the blogs that link there on any day other than Weds. but if you DID see my blog last week you would have seen this post about using the Martha Stewart score board to make paper rosettes. Well, I was tidying and came across a series of little strips that I had punched a scallop along, borrowing the punch at a crop. I hadn’t done anything with them but in an instant I could see lovely scalloped rosettes so I gave it a go. What you can sort of see are some of the samples I have been working on for another You Tube video explaining how I did them and some of the pitfalls various punches produced – and how to overcome them. I just love these. Although I try very hard not to fall back on flowers as the generic embellishment, I do love making them and do love using them on pages about my DD. So quite a varied selection of projects. And the best news? Blogger announced on their forum they would be rolling out something this week to solve the “WordPress folk can’t comment” problem I have been hit by the last couple of weeks! YAY! I tried a comment on a blogspot blog yesterday and it seemed to have taken, although I will have to go back and check that it actually appeared but I am hopeful! I’ll probably do that video today, if I can, so do check back if you are interested or find me on You Tube as UKmaryanne. Categories: WOYWW | Tags: flowers, videos, YouTube | Permalink. As you, probably, know, Adobe Photoshop Elements has not inherited all of the essential features of the full Photoshop. Some functions have been removed, while the others just stay hidden. The “surface” Photoshop Elements functions are quite sufficient for a beginner. As you advance, though, you may miss one or another undocumented function. Here “Elements+” will be of service to you. It’s simple to install and there is a demo version available. It’s available for the PC and Mac versions, so if there are functions that you would like to use that have been supressed in Elements, give this a go. Of if you have an old version of Photoshop (like me) and choose to buy the far cheaper but newer Elements as either a replacement or another option, this may make it all less painful for you. I’ve not worked my way thru all the bits yet, as I am happy flipping between the two for now, using Elements where I can or full PS when I have to, but at some point I may just shelve PS7 and go full Elements. On a side note, DS has downloaded The Gimp (Mac and PC), and loves it, says it is easy to learn as has near as full functionality as the current Photoshop does. I may get a tutorial from him someday and give that a go as well! Categories: Sunday someplace else, tips & finds | Tags: technology & scrapping | Permalink.